There were some surprising non bathroom things that had no business being in a bathroom vanity. Most likely they were shoved in the vanity during a, “Quick make the house presentable because someone’s coming over!” situation. Of course all of you with your perfect homes and family members who don't leave clutter all over the house have no idea what I am talking about. Ahem. I rehomed the crazy items to their proper places. A few more items were supposed to be part of a Restore donation instead of stashed under the sink. Off to the Restore they went. Done. Then I shopped the house for storage and organization items. I didn’t want to lay out cash for new stuff since this is a temporary fix. Fortunately, my family likes to give my gift baskets as gifts. I love to receive them because after I use the items, the containers make excellent home organizers. - I lined the bottom of the cabinet with a patchwork of wallpaper samples. I have a bunch left over from making blog business cards. I selected coordinating colors in the wallpaper patterns so it looks purposeful. I kept hiding this bottle rack from the Purge Police over the years because I knew someday it would store towels. Today is that day - yay! 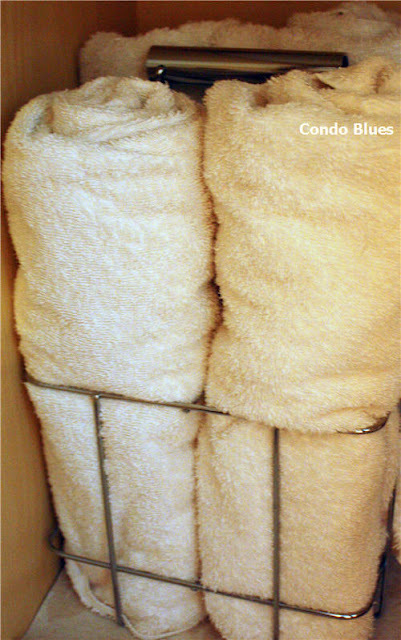 - Two extra baskets hold the matching guest hand towels and washcloths. I will fill the empty travel containers with shampoo, conditioner, etc. from the dispensers in the master bath when we have guests. 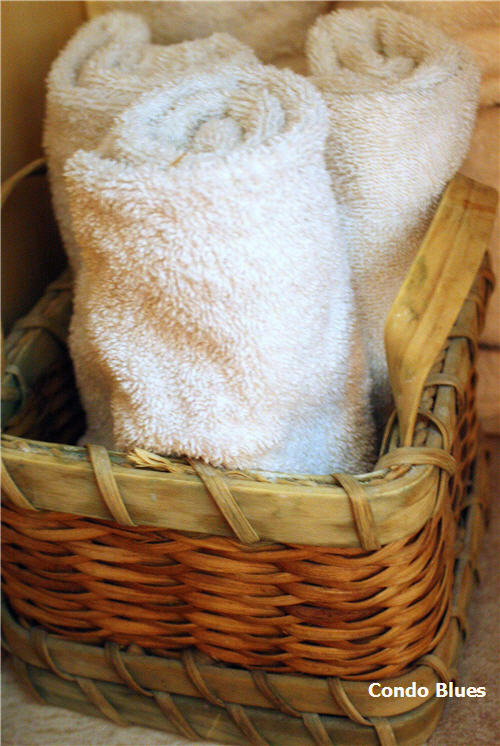 The basket combo reminds of a pretty hotel bath. Yikes, I’m starting to like my hateful vanity. I like the patina on the top of the basket. 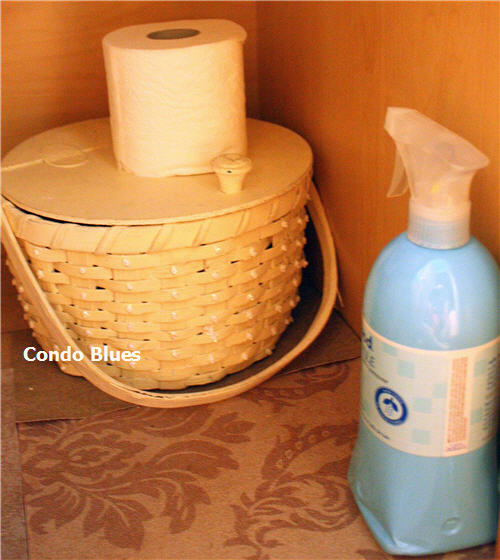 - The lidded basket originally stored cleaning brushes and rags. It stays the same. The only difference is that is isn't buried under a bunch of unrelated bathroom stuff. I like my organized bathroom vanity and how it looks on the inside. It looks purposeful. It does not look like a bunch of random free (and green!) stuff I pulled from around the house. I didn’t expect to be so pleased with the result that it made me change my mind about keeping the vanity. This temporary turned permanent redo is bittersweet. Keeping the current vanity and sink saves me money that I can put toward something special like a fancy faucet. 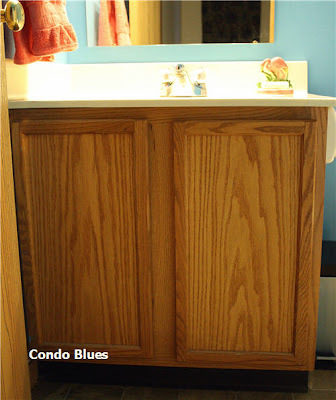 Although I’m still not completely thrilled about my bathroom vanity looking like every other vanity in the neighborhood. I’m going to marinade on this one for a bit. Do you have any suggestions for me? Keep? Paint - what color? Replace? Husband reminded me that the greenest thing is what you already own. However I think he's saying that as incentive for me not to put another multi month bathroom remodel on my project list. Husband is not getting out of a redo that easily. I have a few green tweaks planned for this room. Maw-ha-ha-ha! Stay tuned! Lisa, since i have the identical vanity in the same bathroom and have been dying to replace it forever, I'll tell you my plans for the winter. I didn't get to it this summer... oh well. My fake marble top has cig. burns from previous owner, so that's going to be replaced, I will add a bronze faucet and paint the vanity dark brown to match the wood framed mirror which I already hung to replace the frameless thing that was there. Then, since it is a tiny space, I may put some reclaimed wood flooring down, too. You are a reorganizing whiz! I especially like the little covered basket - it looks like a nice vintage one. I really like the idea of using a vintage dresser for a vanity. On the other hand, to save some money you could compromise and do similar to what Laina27 plans to do- replace the top and paint the cabinet. What does this have to do with fall? I don't think painting would be a bad idea, and add handles to change the look of the doors. Or add some deco trim inside the existing raised areas of the doors. I bought new silver knobs at the Restore for $1.00 each. I will add them to the vanity as soon as I find them again in the garage (I've been cleaning and reorganizing it.) What color should I paint the vanity? For now the sink base stays. I don't want to go with a white vanity. Any ideas? 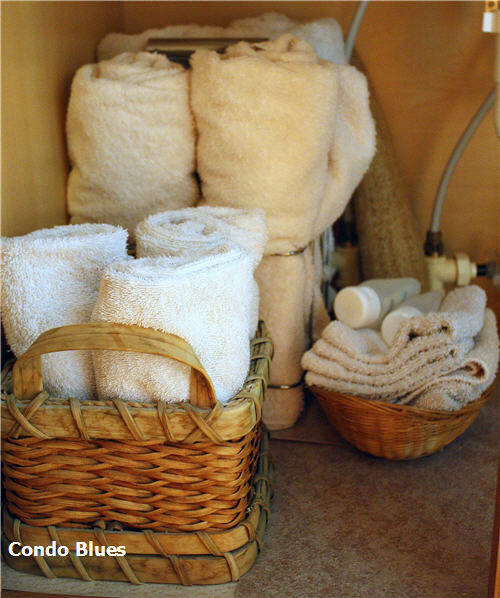 Your guest vanity looks very organized and will be easy for guests to grab towels. The knobs sound like a great idea, and paint would really update it too. Painting it is totally the way to go. White is always a safe bet. I like gray, also, and with the blue walls that I see in the picture, I think it could look really nice. Looks great!! I think some paint and or some cool paper or fabric in the doors would be a cool change! Thanks for linking up to Southern Lovely's Show & Share! Very creative idea! If you get a chance, I'd love to have you link up! (http://scrapbookingez.blogspot.com/2011/09/one-stop-thursday-linky-party_22.html) Thanks for sharing! paint it and maybe add some sort of embellishment on the doors or even some border or something to dress it up? you know a square within a square type thing.